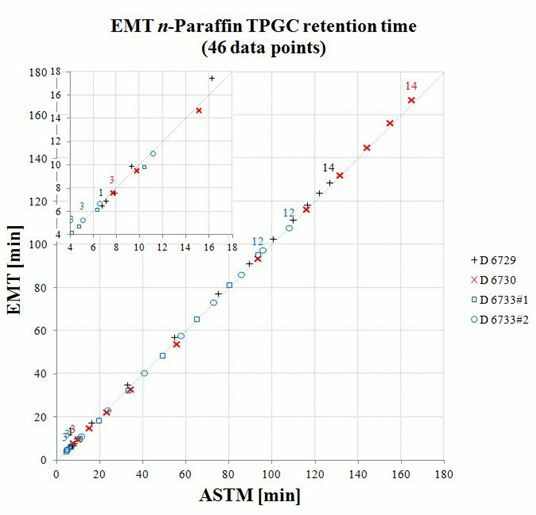 Envantage Method Translator (EMT) is a revolutionary new tool for petroleum and petrochemical chromatographers that can take information obtained from an existing gas chromatography (GC) Method and use it to develop a Fast GC method. Designed for Detailed Hydrocarbon Analysis of gasoline range hydrocarbons, this virtual gas chromatograph factors in the physical chemistry of chromatography by considering pneumatics, efficiency, gas diffusion, liquid diffusion, ….and more! Experiment with new column dimensions and carrier gas type. 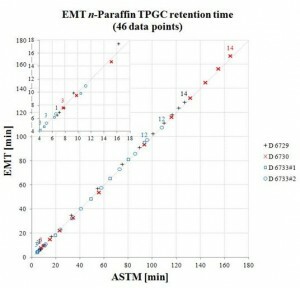 EMT generates a virtual C1 – C14 n-paraffin chromatogram and quantifies the changes in speed, resolution, and sensitivity. Speed Up Your Old GC Methods! Many laboratories are analyzing samples with gas chromatography methods developed 20 and 30 years ago. It was common for method developers to utilize long columns when separation power was needed. Consequently, GC Methods standardized years ago and available through organizations such as ASTM, IP, DIN, and others, frequently specify long columns (100 meters) for the most demanding applications. Shorter, narrower columns can be used to speed up the run times of most of these GC methods without sacrificing separation but replacement Fast GC methods have not been developed and documented. Method Translators have been developed in the past to speed the upgrade process by modeling chromatographic behavior but have lacked robustness and accuracy. Without a reasonable expectation of success chemists have been reluctant to adopt column and instrument recommendations predicted by other Method Translator programs. 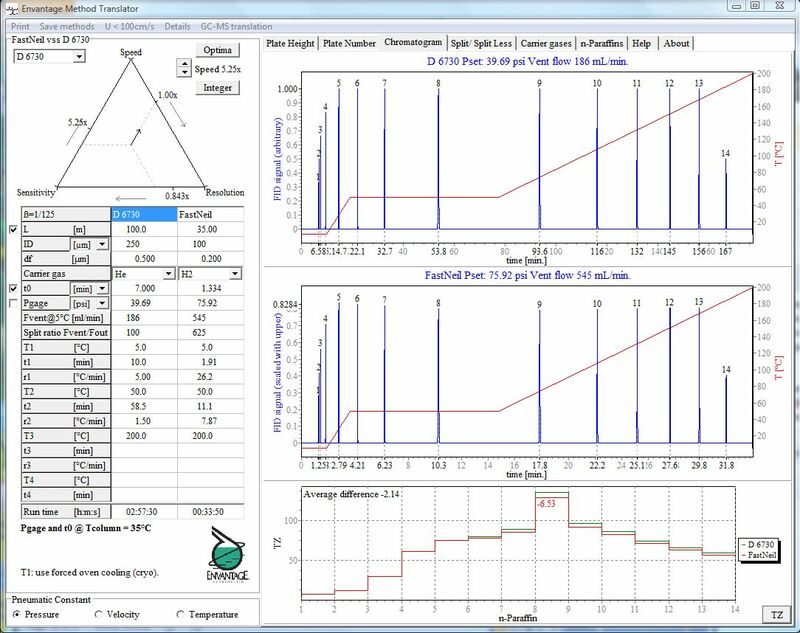 Now, accurate modeling is available that can help facilitate a petroleum laboratory’s migration to Fast GC methods. 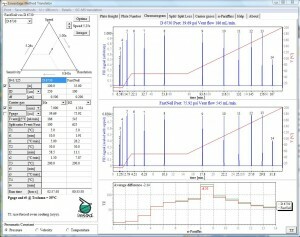 Designed for gasoline range methods developed on dimethylsilicone columns, the Envantage Method Translator will predict instrument settings for shorter, thinner columns using helium, hydrogen, or nitrogen carrier gas. Quality measurements are immediately available, and changes applied to any single variable will instantly be reflected in all measurements. Lab managers will be able to model the integrity of a proposed Fast GC method and verify that the new data will maintain or exceed the specifications of the original method. Sample throughput can be increased by cutting sample run times by half, two-thirds, or more. Why is the Envantage Method Translator Different? Unlike prior Translators the Envantage Method Translator can predict separations that can be achieved utilizing columns and hardware that don’t exist today. EMT challenges industry to develop narrower columns, thinner films, and higher pressure inlet pressure systems.